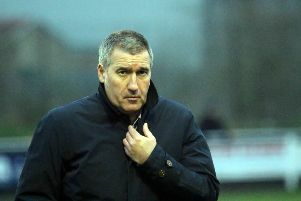 Banbury United boss Mike Ford was delighted to see his side make it five home Evo-Stik League South wins on the spin as they beat in-form Coalville Town 4-2. The Puritans raced into a 3-0 interval lead in Saturday’s premier division central clash through Giorgio Rasulo’s penalty, Greg Kaziboni and top scorer Ravi Shamsi. The returning Lee Henderson added a fourth goal after the interval and, although Alex Dean and substitute Curtis Burrows pulled back a couple of late goals, that failed to take the gloss off another impressive performance. Ford said: “To win any game you have to play well for most of the match and we did. We’ve played well in all five of those home wins, you usually get your rewards if you do but not always. “When you don’t have a midweek game on the back of a defeat, it can be a very long week but the players had a great attitude in training and they were desperate for Saturday’s game. We were fantastic, it was a great afternoon and the fans go home happy again. “We’ve scored four goals against a team that were unbeaten in six games. Once we got the fourth goal, I decided to make a few changes because some players needed a rest. “It was disappointing to concede two late goals but I don’t want that to take anything away from what was an excellent performance. Four out of the five players in defence, including Jack Harding, had played very little football recently and that probably showed towards the end when they tired.